On Friday, September 16, the world celebrated Park(ing) Day 2016, a single day where individuals and groups take over parallel parking spaces, transforming them into miniature parks called “parklets.” The idea is simple: explore how we use—or rather how we could be using—public space in our cities. Streets make up our largest public spaces, but an enormous portion of road space is dedicated to storing parked cars at very low prices. Park(ing) Day asks, what if we used some of that space for something else that benefits the whole community? But what good can a day playing in the street bring? Park(ing) Day is part of a concept called Tactical Urbanism, where small, short-term changes are implemented with the goal of bringing about long-term change. Slowly but surely a community can wrest control of its streets from the firm grip of the automobile and create more valuable public space experiences. That’s exactly what’s happened now in Louisville: those dozens of one-day parklets over the years have helped spur the city’s first semi-permanent parklet. This week, The Community Table debuts at IdeaFestival. The prototype parklet hasn’t hit the streets quite yet, though—it’s located inside the lobby of the Kentucky Center for the Arts where Mayor Greg Fischer will be using the space as his mobile office during the innovation conference. The Community Table was designed by Louisville’s Gresham Smith & Partners and Lexington’s Nomi Design and commissioned by Metro Louisville. This is the sixth year the mayor has relocated his office to IdeaFestival. “Each year we’ve tried to do something a little different,” Chris Poynter, the mayor’s spokesperson, told Broken Sidewalk. In the beginning, the office was just a standard desk, but “we decided to engage artists and architects to create pieces that could be created for IdeaFestival and be used elsewhere afterwards.” Last year, architect Nathan Smith built a zigzagging table with indoor and outdoor seating that appeared to move through the Kentucky Center’s glass facade. That table was later reused during the Resurfaced pop-up event at Tenth Street celebrating the city’s Connect/Disconnect public art exhibition. The parklet’s design remains true to its name. Built on an elevated platform that makes the parklet flush with the sidewalk, the parking-space sized public space (8 feet by 18 feet) includes a large table with bike parking on one side. The table is big enough that a couple small groups can use it at the same time or one large group could fill the space. It’s also designed so wheelchairs can roll onto the parklet and fit comfortably at the table. “We started by thinking about what the parklet needed to do,” Louis Johnson, a project manager at Gresham Smith & Partners told Broken Sidewalk. “The whole idea was to create a space where the mayor could engage in casual or more formal conversations and community dialogue. It had to transition well to The Table restaurant.” GSP and Nomi looked at parklets from around the country for examples of designs that work well. “People want a place where they feel safe sitting along the roadway,” he said. Johnson collaborated on the design with a team from Nomi, which opened an office in Louisville this year. 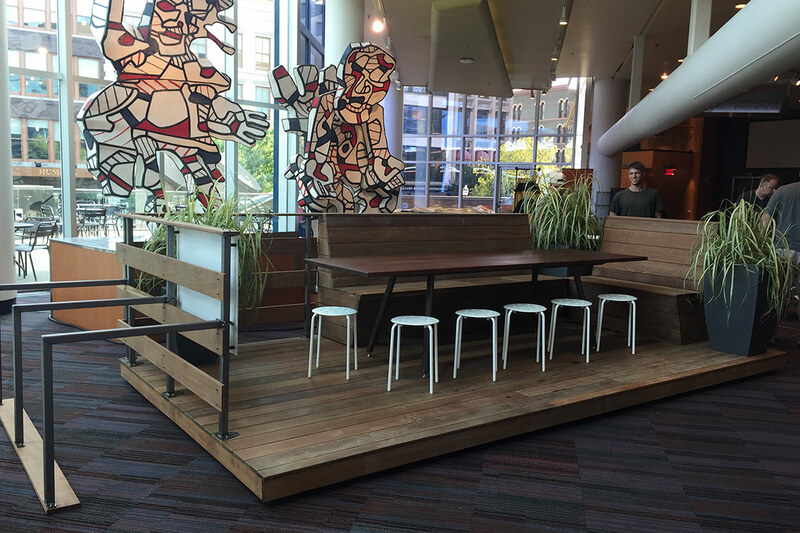 Nomi fabricated the parklet in its Lexington studio and hauled the modular pieces over to Louisville yesterday to be assembled at the Kentucky Center. 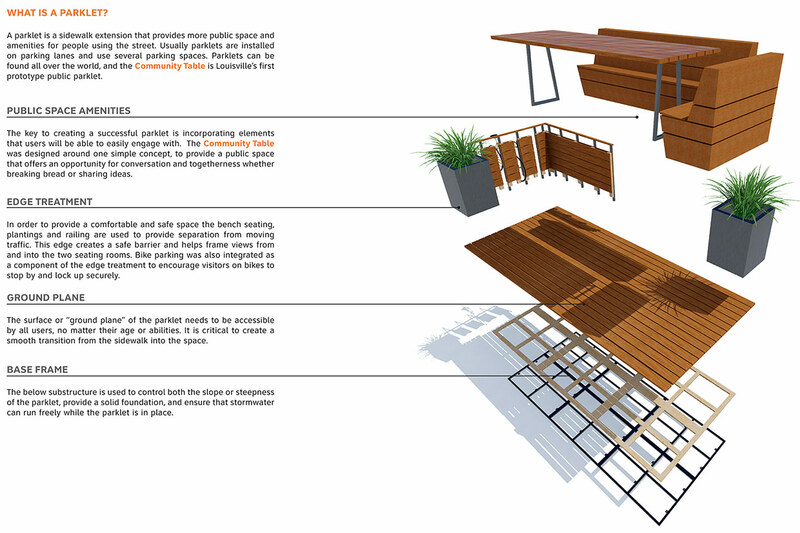 The four-piece modular design allows the parklet to be easily assembled or disassembled and moved to a new location. “We had about two-and-a-half weeks to get it from design to fabrication,” Johnson said. “Nomi is really strong with materiality, and that’s really important since this is the city’s first prototype. 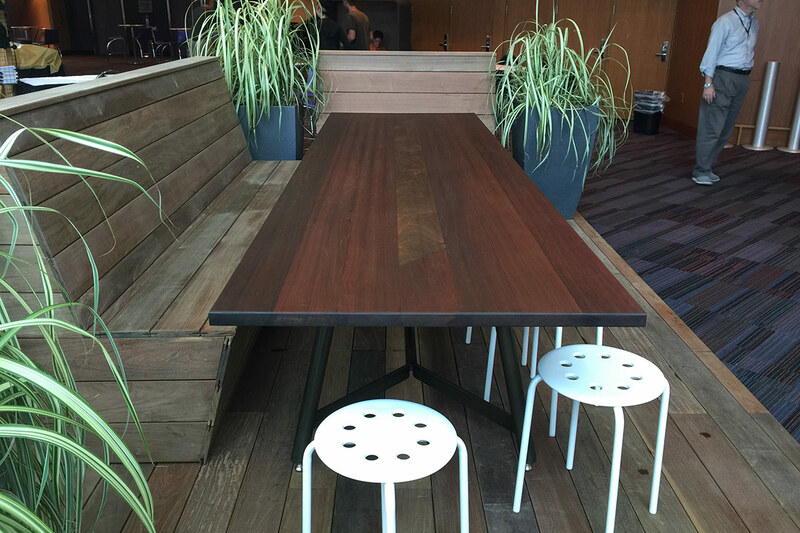 It had to be really durable.” The parklet is made of Ipe wood and steel. Ipe, sometimes called TKTK, is the same wood used in New York City’s park benches and boardwalks because of its ability to stand up to the elements. “It’s pretty much the best wood available,” Johnson added. After IdeaFestival, The Community Table will be relocated to a parallel parking spot in front of The Table restaurant in Portland, where it will provide outdoor seating for lunch patrons or simply a space to hang out or talk with friends. Poynter said the parklet could also eventually be moved to other locations around the city. Parklets are not a new concept. Similar on-street public spaces have been used for years in cities across the country from San Francisco to Chicago to New York. This year, Covington, Kentucky, received national praise for its own parklet program called Curb’d which installed five parklets on its streets. “A lot of cities are way ahead of us in this measure,” Poynter said. “This is not a new concept.” In Covington as in most cities, the parklets are installed in the spring and disassembled and put in storage in the fall to minimize wear and tear and make plowing streets in winter easier. That parklet policy will also address what kinds of streets the parklets can be built on. “A lot of the streets that we’d want to do parklets on are state roads,” Poynter said, noting that the discussion about parklets began last year when Heine Brothers Coffee wanted to build a parklet in front of its store on Frankfort Avenue. The state currently doesn’t allow for such installations on roads like Frankfort, but Poynter said a team from the city’s advanced planning and public works departments will work out details with the state on implementing parklets on state-controlled streets in the city. “For us it was a bit of a research project about open space,” GBBN’s Matt Nett told Broken Sidewalk. GBBN’s three U.S. offices in Louisville, Cincinnati, and Pittsburgh all studied people’s behavior using their Park(ing) Day spaces in a similar manner as famed urbanist William “Holly” Whyte’s research into the Social Life of Small Urban Spaces in New York City in the 1970s. Architects at GBBN watched where and how people used the parklet—whether they chose to sit closer to the street or the sidewalk, how they used moveable seating, and whether people interacted with with a punching bag, a nod to Muhammad Ali and the Ali Center around the corner. “I was impressed by the amount of engagement it did receive,” Nett said. This fall, GBBN’s observations will be collected into an exhibition that will be on display in the firm’s lobby. 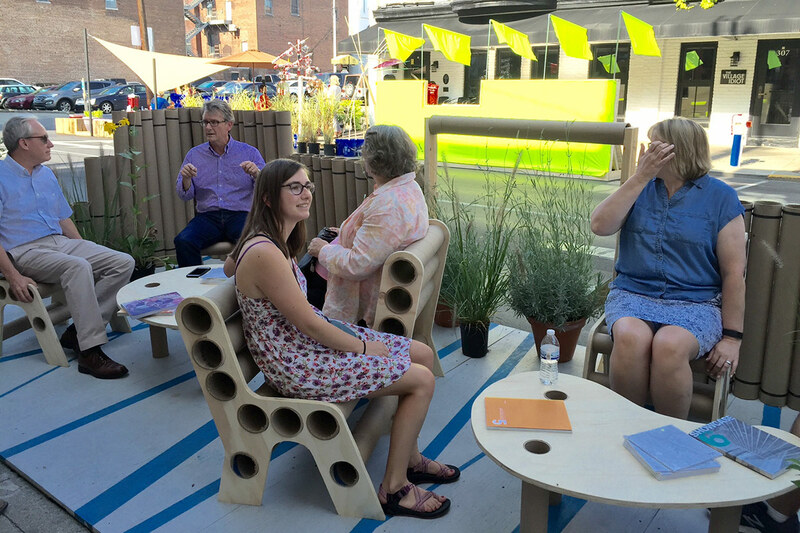 Gresham Smith & Partners also participated in Park(ing) Day this year, working with the Kentucky chapter of the American Society of Landscape Architects (ASLA) on a temporary parklet in Lexington. “Events like Park(ing) Day are all about creating awareness and creating spaces for people,” Johnson said.”The statement that we’re really making is that streets can be rethought as public spaces.” In the spectrum of Tactical Urbanism’s temporary to permanent approach, “the[semi-permanent] parklet is the mid-term version,” he said. Way back in 2012, IdeaFestival played host to another temporary parklet commissioned by the 21c Museum Hotel for Park(ing) Day. 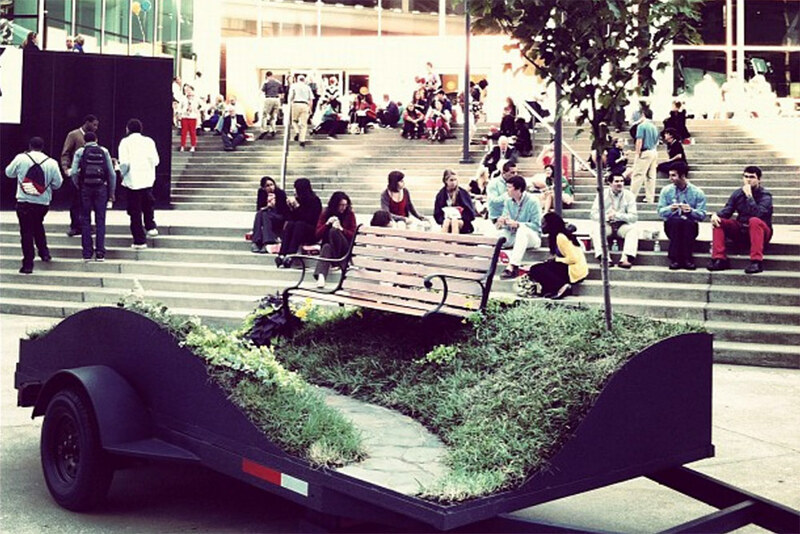 The “mobile parklet” built on the back of a trailer featured undulating sod with a park bench and was on display in front of the Kentucky Center. 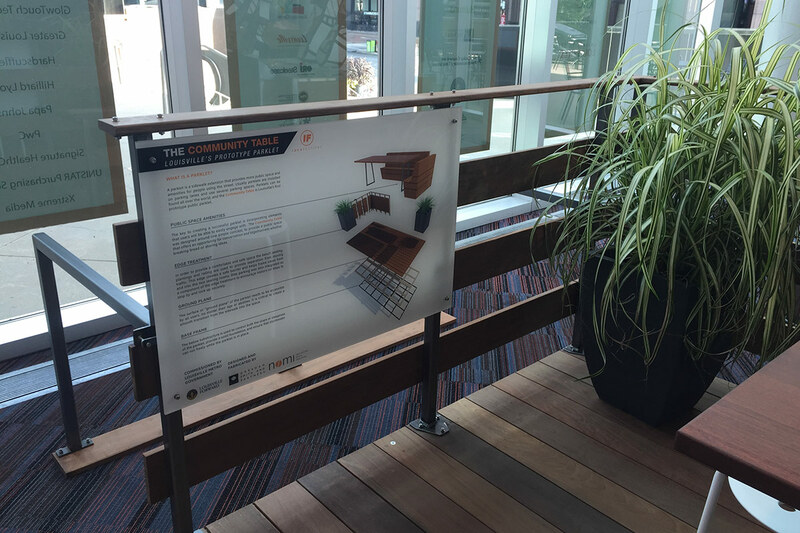 Stop by the Kentucky Center beginning today through Friday to see The Community Table parklet and share your own innovative ideas for the city with the mayor and his team. 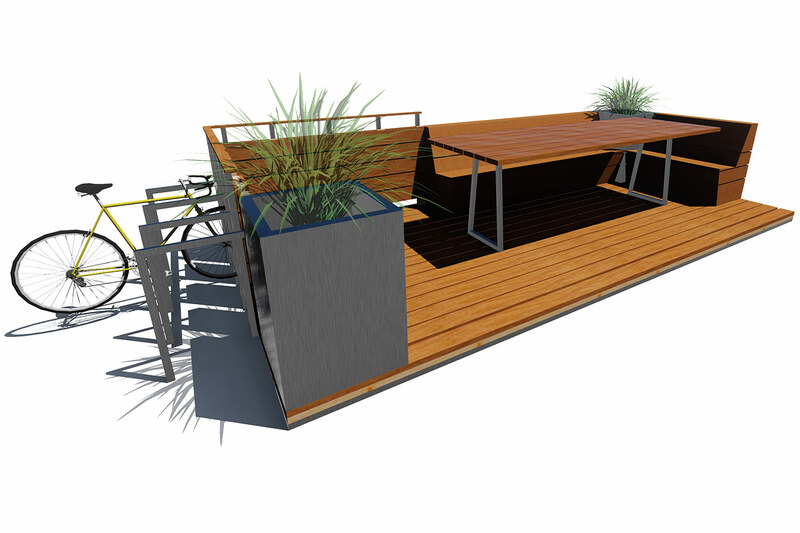 We’ll keep you updated with progress on the city’s parklet policy as it develops.